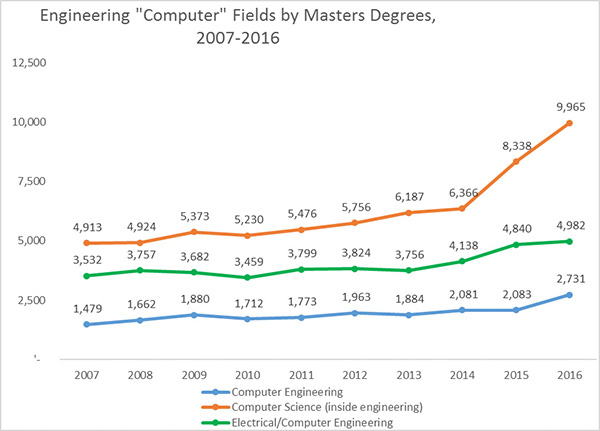 The accompanying graphic looks at master’s degrees awarded from 2007-2016 in computer engineering, computer science (inside engineering), and electrical/computer engineering. Overall, the most master’s degrees were awarded in computer science (inside engineering), followed by electrical/computer engineering, and computer engineering. While there was minimal to moderate change from 2007-2014, there was a sharp increase in the number of master’s degrees in computer science (inside engineering) from 2014-2016. Source: ASEE’s annual Profiles of Engineering and Engineering Technology Colleges. This entry was posted in Engineering Careers, Engineering Education and tagged ASEE, computer science by Celeste Baine. Bookmark the permalink.